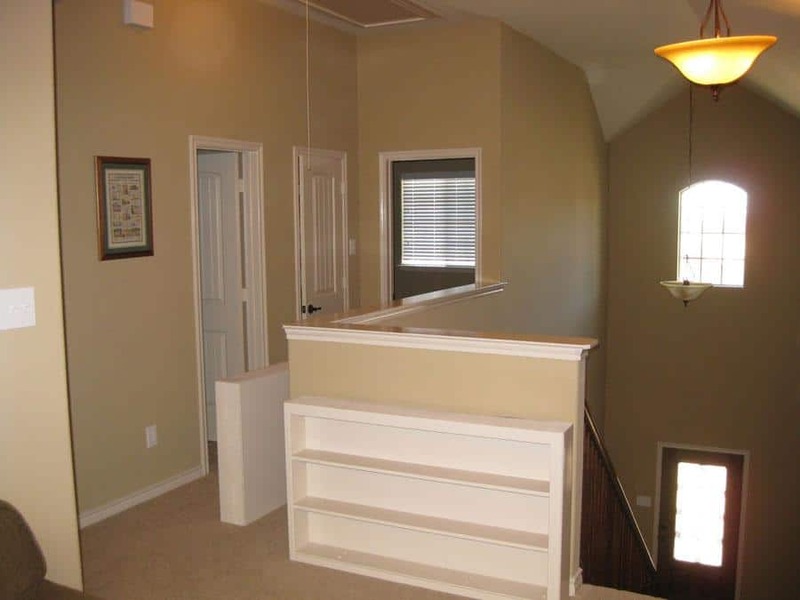 Here's how to build a bookshelf for both storage and safety where small children and 2nd floor half walls that overlook a first floor are concerned. This bookshelf project took about 25 working hours to complete and another 4 to 5 hours to install and apply the finishing touches. I worked on it over a two week period. They turned out looking great and the final product is very strong. It would be pretty difficult to go into all the exact specifics and dimensions and all on how to build a bookshelf, particularly this exact one, but hopefully what I am putting into this article and the photos I took will give you enough information to see how to build a bookshelf on your own using your own dimensions and creativity. The idea was to extend the wall upward for added safety and increase storage space at the same time. A lot of time was spend thinking about how to build a bookshelf for this customer since I had to work with precise existing measurements. The final size of the shelves accommodated DVD's exactly, which was our target size. I used materials you can get at any Home Depot…the shelf material is primed pine (the straightest precut shelving wood that home depot sells) and the backs are made from 1/2" birch. Because the birch plywood is high grade, very little sanding was needed before painting. Birch is very solid and I needed the backs to be as strong as possible. 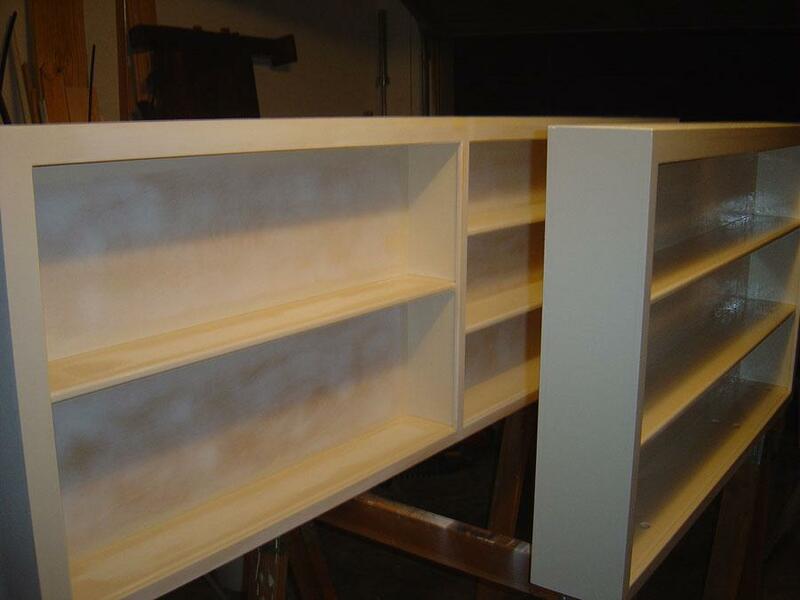 The shelves were built in 5 separate pieces - the long shelf, the short shelf, the corner, and the "cap", which was 2 pieces due to the 90 degree turn in the shelves that I carried to my customer's house at the time of installation. 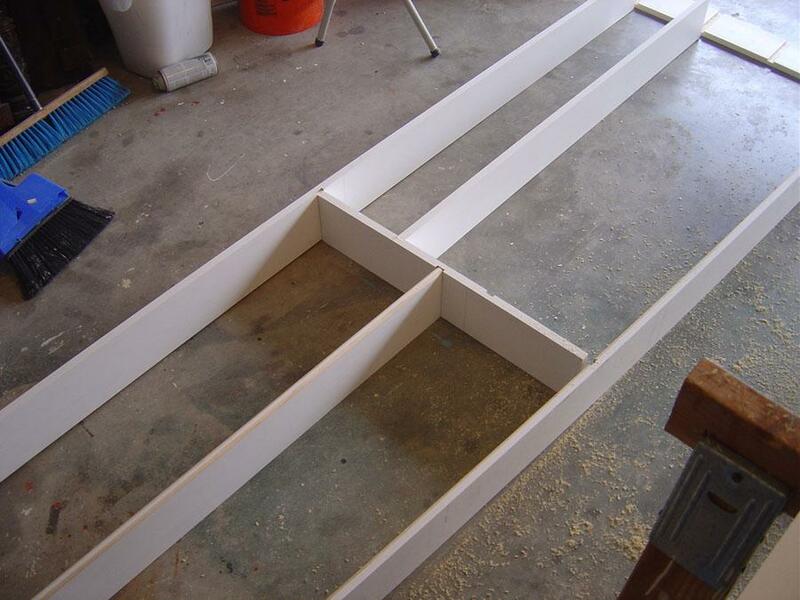 Your half wall dimensions will likely be different than these so I will go over how to build a bookshelf in general terms so you can get the gist of it. The top shelf and the bottom of the case are 2 thicknesses of the 3/4" shelving. The bottom is doubled for strength and the top was doubled for continuity so the final book case had a balanced look. Besides, I figured it will add a lot of strength to the shelves and it gave me more to nail and glue the backs to. This is not normally how to build a bookshelf, but it is how to build a very strong bookshelf! A note about glue: I glued everything together. It adds so much structural strength I am not sure I would know how to build a bookshelf without gluing everything together. That's me...I used my nail gun too and nailed this project together using 1-1/2" finishing nails as well. Of course I had to go back and fill all the holes before painting, but that's what I did.. 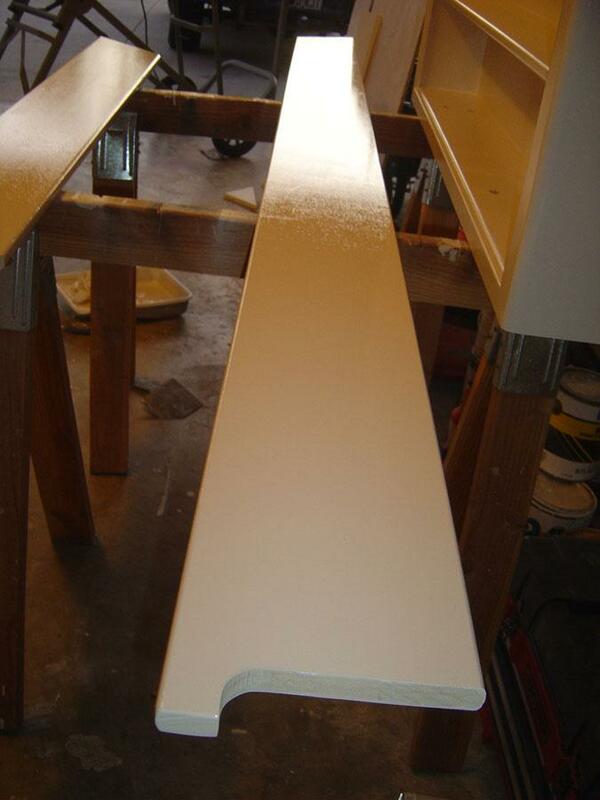 The cap of the half wall (the top of the existing wall) is made from 1 X 8 paint grade pine, which is pretty standard. The actual size is 3/4" X 7-1/4" and Home Depot sells this exact size. They don't come with corners finished, so you'll need to use a router for the edges. In fact, I used a 1/4" round over bit for most every edge for a softer, smoother final "look". The only other router bit used was a 3/4" straight bit for the shelves themselves. I trimmed out the top, bottom and sides of the shelves using doorway moulding which already has a 1/4" rounded corner. Probably the most important tool I used for construction was a table mitre saw. I love using hand tools, but the table mitre saw saves a heck of a lot of time and is way more accurate than cutting everything by hand. In your approach to thinking about how to build a bookshelf for yourself, think about larger cutting tools, like table saws and mitre saws. Hand tools require a good bit of practice and patience, but using precise cutting tools really are how to build a bookshelf that's very precise and strong. To attach the finished shelves to the existing half wall, I drilled a 3/4" hole using a paddle bit which I made 9/16" deep. Then I used a 1/4" bit to finish the hole. I didn't scrimp on the attaching bolts (6 in the short book case, one in the corner shelf and 4 in the long bookcase. For installation i used 4" hex bolts and washers. (just add up all the dimensions of your wood and you'll come up with a total of 4" required to get through everything you need to get through…- 1" for the base of the bookcase, 3/4" for the existing cap and 1-3/4" for the 2X4 runner that you can't see, plus a little extra for the "gap" between the existing cap and the 2X4. After installation I used some 3/4" plugs that I cut and tapped them in just a little bit past the surface, used Elmer's wood filler and sanded that down after it dried so the surface would be flush. Finally I used a paint sprayer filled with thinned paint to cover my plugs. A little trick I use for touch up paint besides the Preval Sprayer is adding some Penetrol Flood Oil Based Paint Smoother. It helps the paint dry smooth and removes brush strokes and roller marks. A quart was more than enough to smooth the 1/2 gallon used for painting the shelves. Finally, I wiped everything down with a rag dampened with mineral spirits. That removes all the dust and makes a better "presentation" of the final work. The materials for this shelf ran just over $400 so be prepared to spend some money on a project like this. I may have been able to use cheaper materials, but I think spending extra up front saves a lot of time in sanding and finish work, so it's worth it to me. I actually designed the corner last so I could think about how I wanted to build it, so in a way, the corner shelf had the least amount of design time in it, but the customer mentioned how much she liked the corner so maybe I over-thought the rest of it…mmm, maybe not. I hope this article makes it easier for you to think about how to build a bookshelf for yourself or someone you know. I got a lot of pleasure from this project and loved the final product. View from the 1st floor looking up.